Somehow, while we were busy doing all the many things we do, half a year has slipped by again. How is it possible that the days can seem so very long sometimes, but the months slip by so fast? Well, I haven't decided yet if I want to call this one done or not. 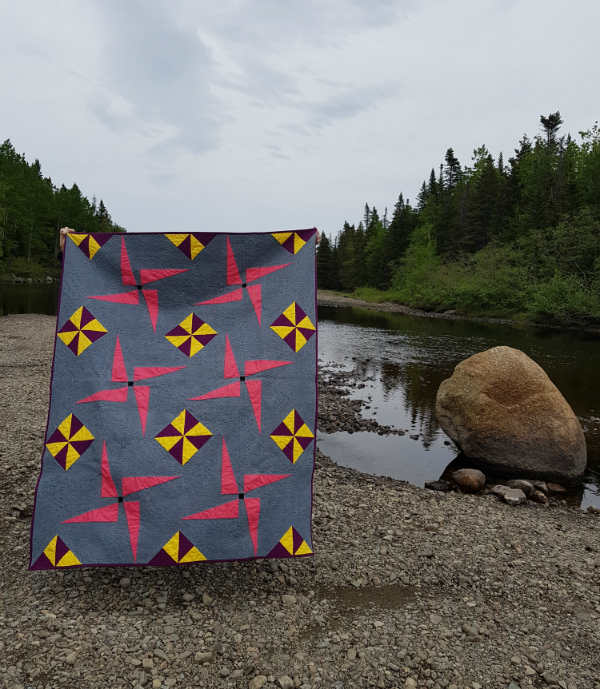 When I put out the call for quilt blocks to make quilts for the seniors who lost everything in a fire in April, I had no idea the response would be so incredible. 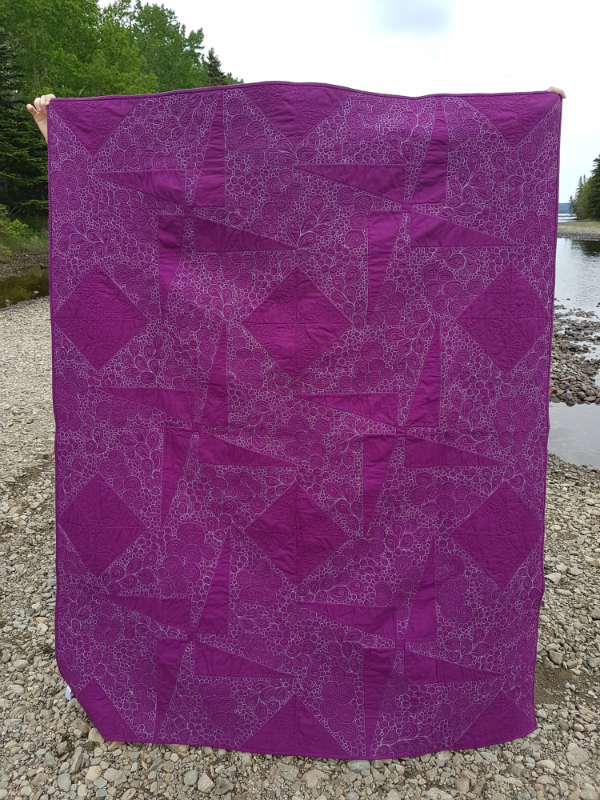 Quilters from 9 provinces and 1 territory in Canada, 30+ American states as well as from Australia and the UK sent me blocks, full quilts, binding, batting, backing and even money to help with costs. It's not quite what I meant when I set that goal, but I did leave the type of sew-a-long wide open, and the block drive certainly got a lot of people sewing along together! 2. Start hand quilting my Hexie Flowers quilt. This poor quilt top has been sitting in my cupboard for over a year. I want to hand quilt it, both because I think it would complement the hand stitched EPP and because I find I'm wanting a hand quilting project again. Obviously, this will be a long term project, but I at least want to get it started. Okay, technically, this one is done. I did start hand quilting it. And then I stopped. I worked on it one evening, stitching around one flower once and part of a second time. I didn't particularly enjoy it and I haven't touched it since. EPP means there are seam allowances on both sides of the seam, so there's really no way to get around stitching through the seam allowance and it just wasn't going well. The quilt is currently sitting in my closet and makes me feel guilty every time I see it, so I think it's time to admit I'm not going to hand quilt it. 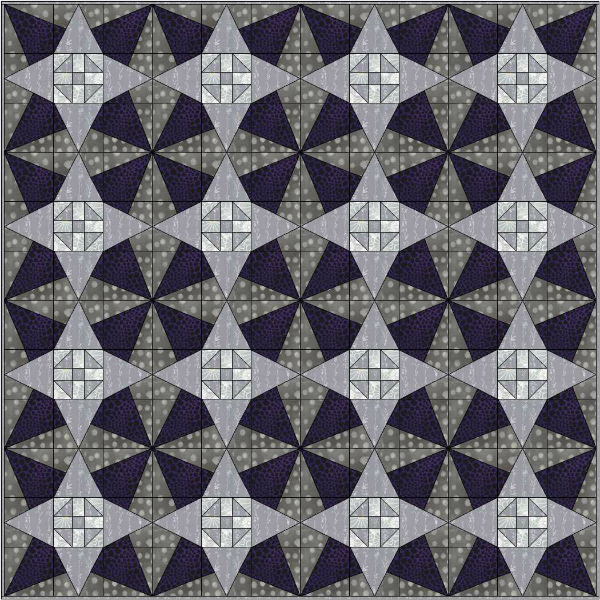 Let's officially change this goal to machine quilt my Hexie Flowers quilt before the year is out. We'll see where it stands when I check back in 6 months. 3. Grow my design business. I really enjoy the whole process of designing and writing patterns, and I do a little happy dance every time someone buys one of my patterns. I'd love to do more of that happy dancing in 2017! Well, there has been some happy dancing going on because of pattern sales, so that's good. I've also started working with some brands as sponsors. Make Modern magazine (affiliate link) sponsored prizes for the Spring into Colour 2017 photo challenge and Northcott Fabrics has sponsored a secret sewing project I'll be starting soon. That feels like a step towards growing my business. There's still a lot of room for growth, though, so I want to try to focus on this more through the second half of the year. Want to see what patterns I have available? Check out my pattern store! 4. Keep seeking magazine publication. That's part of growing my design business, but I think it's an important enough part of deserve to be a goal of its own. 5. Share 10 new tutorials or patterns. 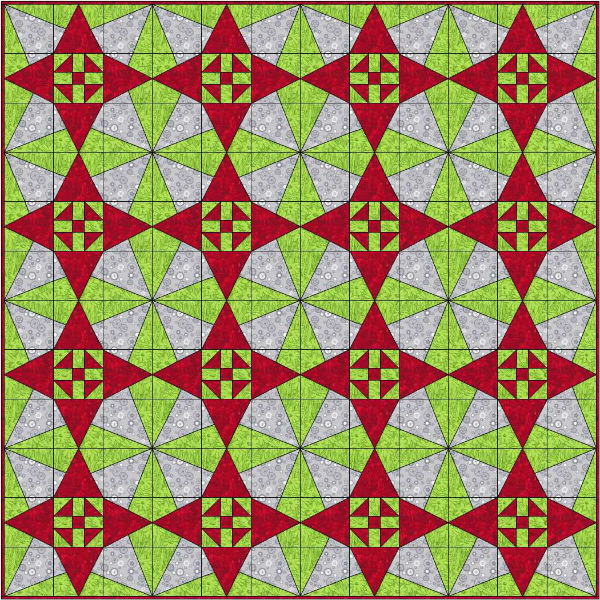 Since I already have three patterns in the works, it should be completely doable to reach 10 before the end of the year. Especially considering how many ideas I have! 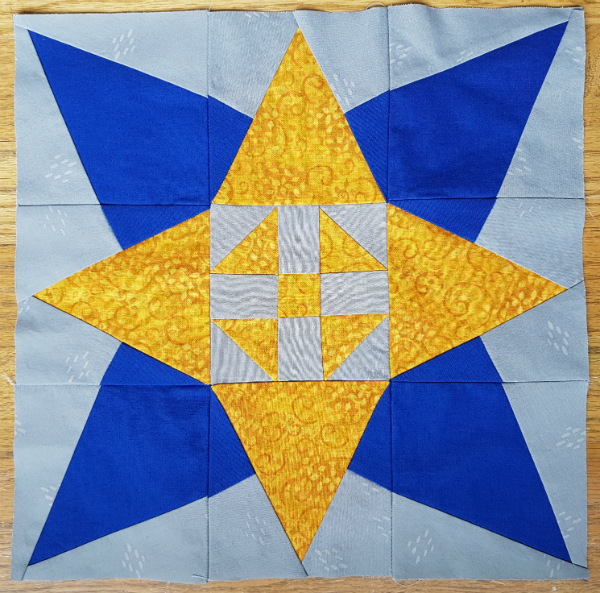 I've shared 2 new tutorials so far, both for new 12" blocks with fun secondary patterns - Connections and Layered Star. I've also released 2 patterns - Love Birds and my free Wind Farm pattern, which is available exclusively to subscribers to my newsletter, The Bulletin. 4 of 10 isn't bad for halfway through the year, right? Nope. I'm not at all on target for this one. The quilts for the seniors kind of took priority over any UFO sewing I might have been doing. We'll see how the second half of the year goes for this goal. That's where things stand for me so far for the year. It's a mixed bag, but I kind of expected that with the quilts for the seniors being a big and unexpected project, so I'm pleased with where I am so far. How about you? Do you set yearly goals? And if you do set goals, do you do a mid-year review? * This post contains an affiliate link, which means if you click the link and then make a purchase I may receive a small commission. This does not affect the price you pay. 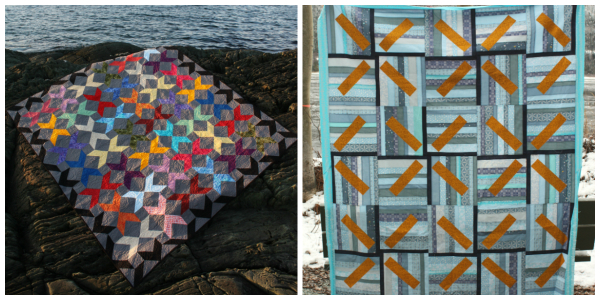 Do you remember this quilt, from my 5 More Things I Learned While Flow Quilting post? 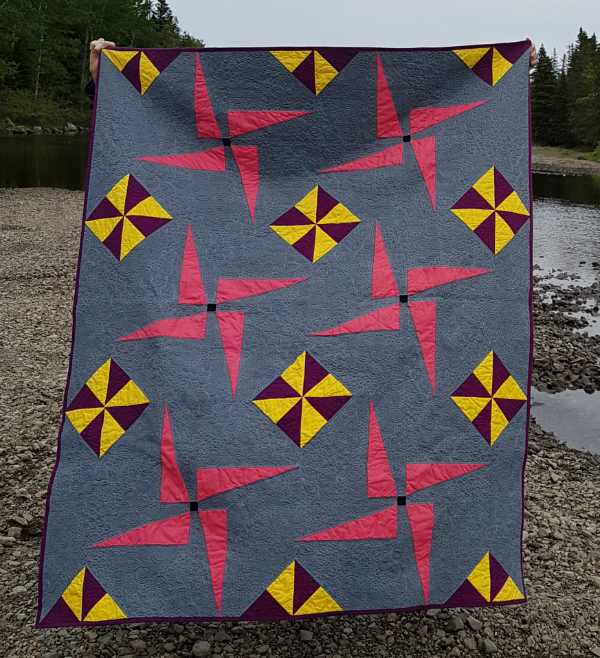 Pinwheels have always been one of my favourite quilting blocks, so it was fun to come up with a design that uses two very different pinwheels. 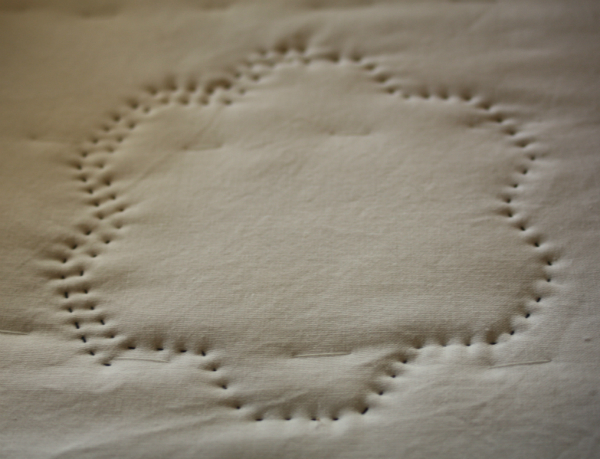 I love the simplicity of the piecing and just look at all of that negative space! I had so much fun filling it up with flow quilting. Pinwheel Whirl finishes at 60" x 72". My version was made using Kona graphite, berry, punch, canary and black. 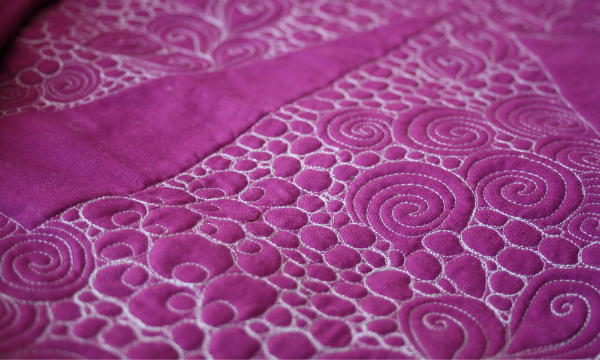 I used Aurifil 2610 for the flow quilting and I love how it looks against the Kona berry on the back. Aiden doesn't look very pleased to be having his picture taken, does he? The July/August issue of Modern Patchwork is available now. It was rather exciting to have my copies arrive as this is my first print publication and, since I usually struggle with my quilt styling and photography, it was fun to see how they styled it (beautifully, I might add). 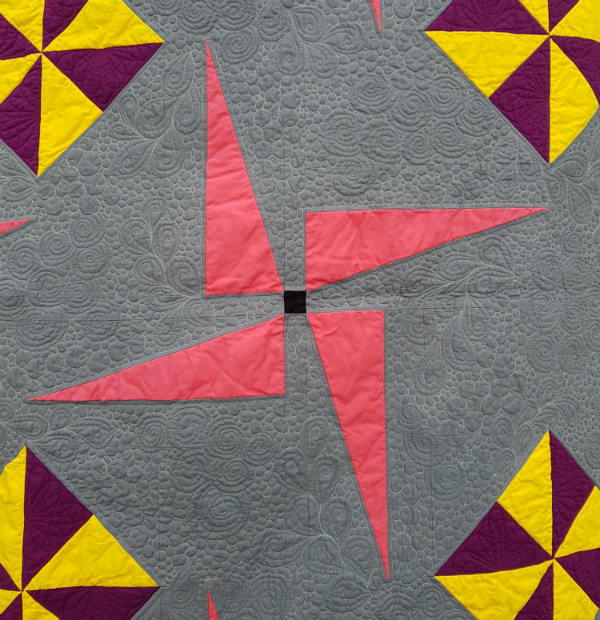 As always, if you make Pinwheel Whirl, I'd love to see your version, so be sure to tag me on IG (@devotedquilter) or FB (@devotedquilterdesigns) or send pictures to devotedquilter at gmail dot com. I can't wait to see how you interpret the design! Last week, while talking to a 5 year old girl, Nathan used the word stupid. She looked at him, wide-eyed, and said, "You said a bad word!" When he told me the story, I had to explain that many families don't allow little kids to use the word stupid because it's usually used in the context of calling someone names. Apparently he doesn't remember that he wasn't allowed to use the word when he was younger either, lol. That conversation with Nathan made me think of other times when word choice was an issue with little kids. There was the time we were in our church's Thursday night children's program and Michelle made a mistake during her presentation and said, "Crap." The kids nearly exploded in their shock! Meanwhile, we three leaders were all looking at each other in surprise, thinking, "That's a bad word?" None of us had any issue with the word, but apparently these kids had been taught it was bad. And when Aiden was in grade 1 he was asked to narrate the kindergarten dramatization of the Christmas story during the school's Christmas concert. The kindergarten student who had been chosen as narrator wouldn't do it because he had been taught that "Jesus" is a curse word and he wouldn't say it. Of course, there are also instances where the pendulum swings the other way and kids aren't restricted from using any words at all. 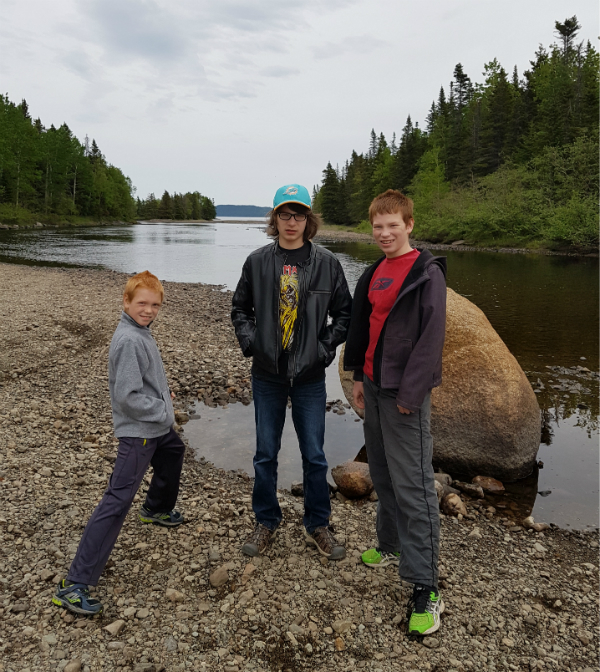 When Nathan was in grade 1 there was a child in his class who could say whatever he wanted. His language was so bad that Paul had to speak to him one day when he was playing outside with Nathan because Paul couldn't handle the foul language coming from him! Zach once asked me what makes a bad word bad, and I really had no answer for him. The best I could come up with is that society decides certain words are inappropriate for use in polite conversation. There really is no set standard that applies to all societies for what constitutes bad language. Ephesians 4:29: "Do not let any unwholesome talk come out of your mouths, but only what is helpful for building others up according to their needs, that it may benefit those who listen." Colossians 4:6: "Let your conversation be always full of grace, seasoned with salt, so that you may know how to answer everyone." Psalm 19:14: "May these words of my mouth and this meditation of my heart be pleasing in your sight, Lord, my Rock and my Redeemer." 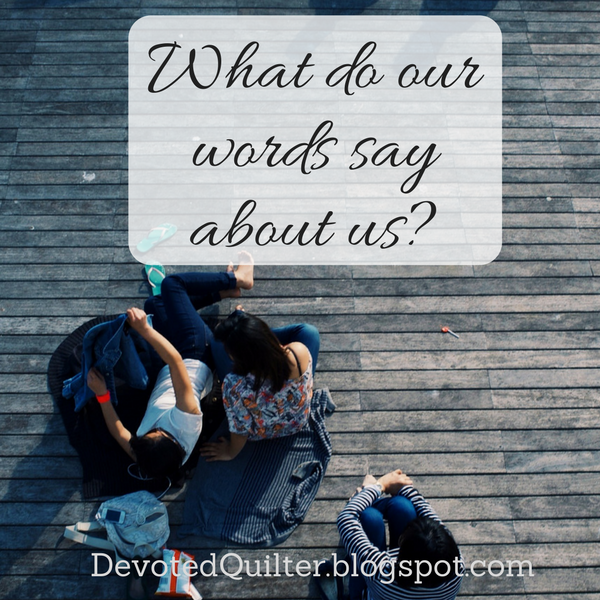 What do our words say about us? How do we use our words to talk to others? How do we talk about others? Is our speech helpful for building others up, or are we more likely to tear them down? Is our conversation always full of grace, or full of judgement? Are we even aware of how we talk? Do we listen to ourselves enough to hear negativity or judgement or condemnation when they come out of our mouths? These are questions worth pondering as we go about our days, chatting with cashiers and friends, waitresses, family members and co-workers. What pops out of our mouths when we drop something is probably less important that what we say when someone hurts us. And what we say when we stub a toe is probably less important than what we say about the people we work with. This week, let's try to be sure we're choosing appropriate words. 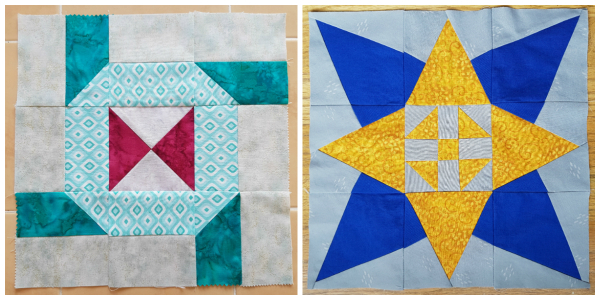 Today's the day for the Summer Block Party blog hop, hosted by Jen at Faith and Fabric! If this is your first time here, welcome! I hope you'll look around a little while you're here. You can find my tutorials under the "Tutorials" tab at the top of the blog and my patterns are all listed under the tab marked "Pattern Store." I share a devotion each Monday and you can find them under the tab "Devotions" (though apparently I haven't updated it in a while...I need to get to work on that!). And please sign up for my monthly newsletter, The Bulletin. 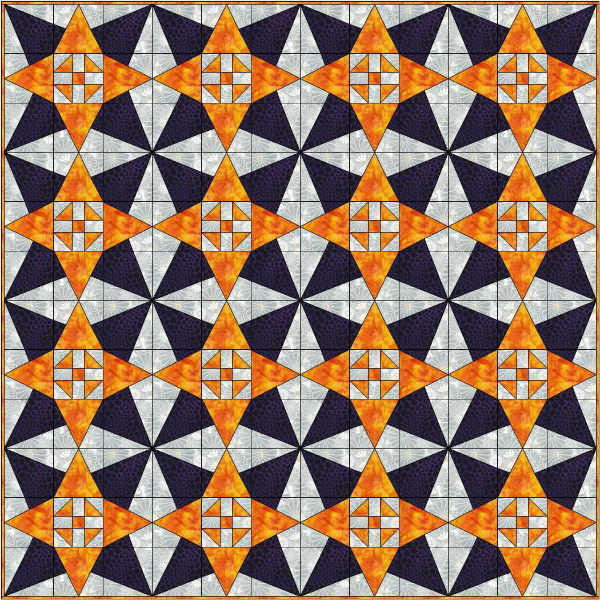 If you do you'll get a copy of my Wind Farm quilt pattern, available exclusively to subscribers. Then, on the 16th of each month, you'll get The Bulletin, where I share news from here on the blog, a family favourite recipe and a themed collection of fun things to make. 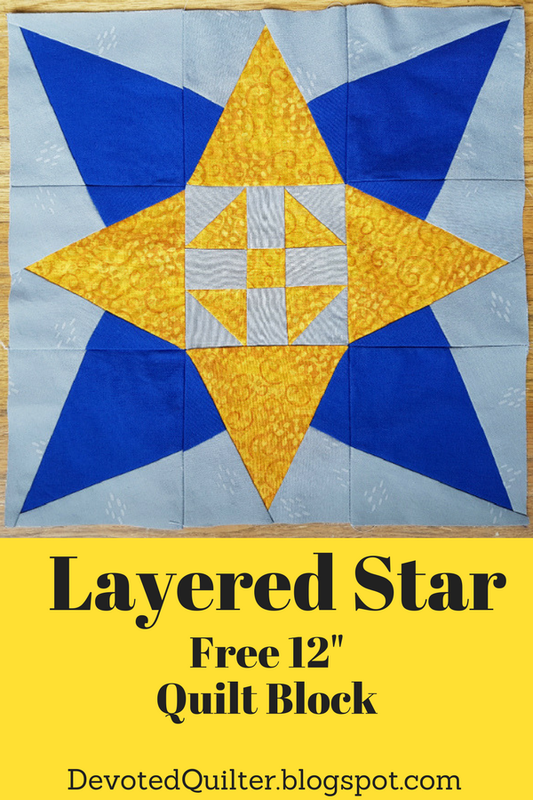 And now, without further ado, here is my new block for the block party - Layered Star! 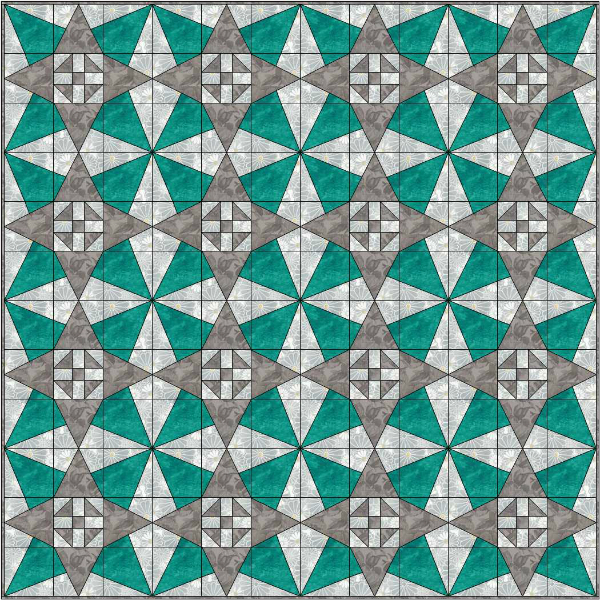 I like the block by itself, but the fun really comes when you tile blocks together to make a quilt. I love blocks that create a secondary pattern! I couldn't resist trying a few different colour palettes, too. Blue and grey. And one last one...a Christmas version. Which version will you make? Okay, let's get started! First up, you need to download the free PDF, which includes the paper foundations you'll need. 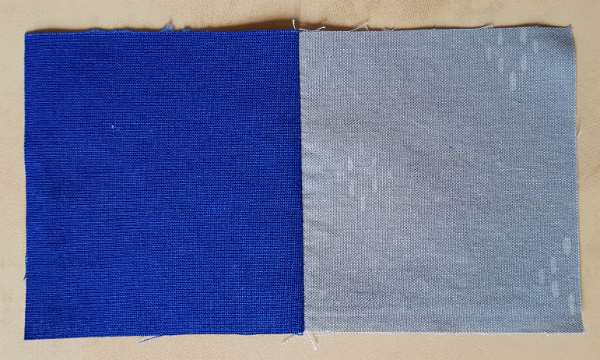 You need 3 fabrics for this block and you want to be sure there is good contrast between them all. 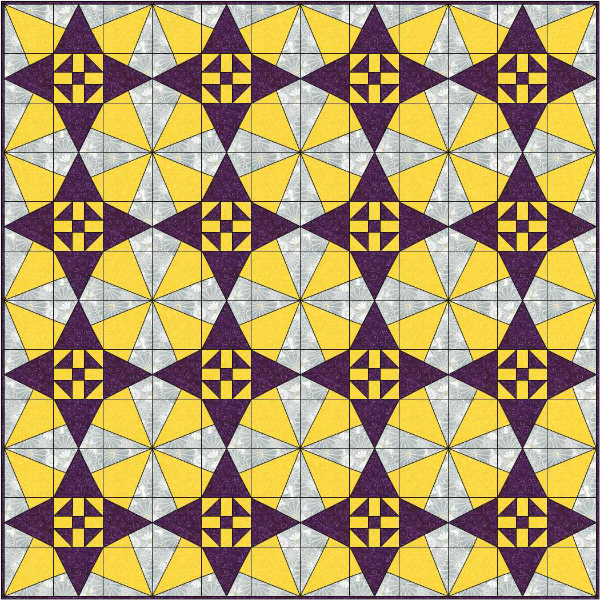 Yellow - 1 square 1 1/2" x 1 1/2"
2 squares 2 1/2" x 2 1/2"
4 squares 5" x 5"
Grey - 4 rectangles 2" x 1 1/2"
8 squares 3" x 3"
8 rectangles 5 1/2" x 2 1/2"
Blue - 4 squares 5" x 5"
Draw a diagonal line on the back of both of the grey 2 1/2" squares. 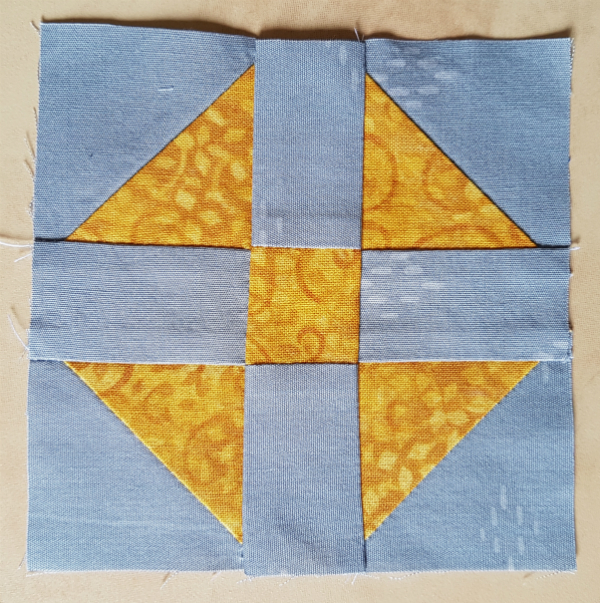 Pair each grey square with a yellow 2 1/2" square, right sides together, and sew 1/4" from the line on both sides. Cut apart on the drawn line and press open. Trim each HST to 2" x 2". 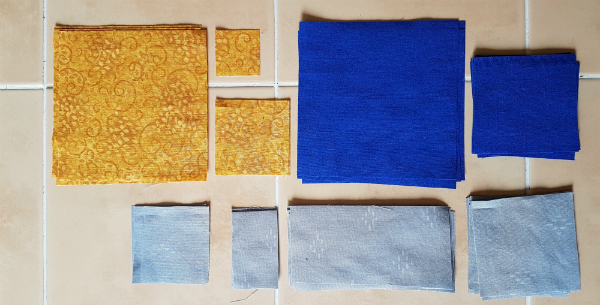 If you'd like a more detailed tutorial for making the HSTs, complete with pictures, check out this post. 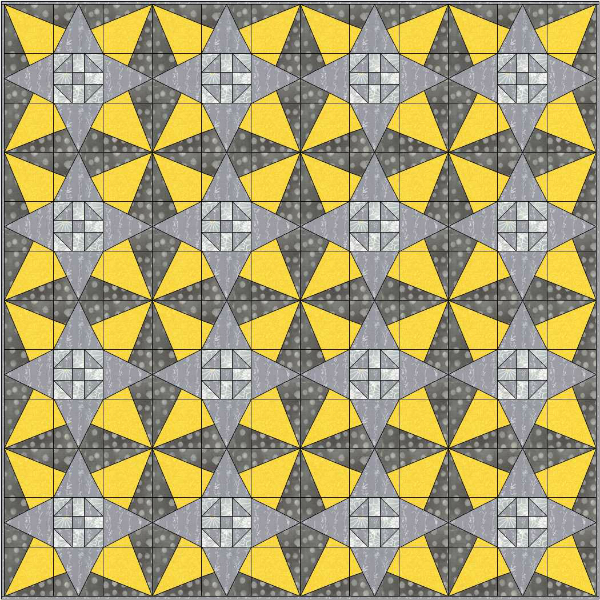 Using the yellow 1 1/2" square, the HSTs and the grey 2" x 1 1/2" rectangles, lay out the Shoo Fly block in a 3 x 3 grid. Join the pieces into rows, then join the rows together. Print out 4 copies of the templates. 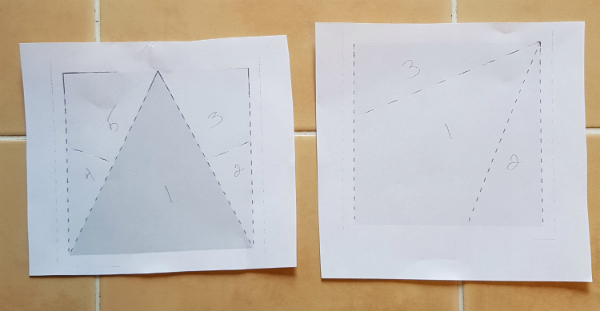 Make sure your printer is set to "Actual size" and then measure to be sure the squares are exactly 4" on a side (4 1/2" if you measure the outer seam allowance line). 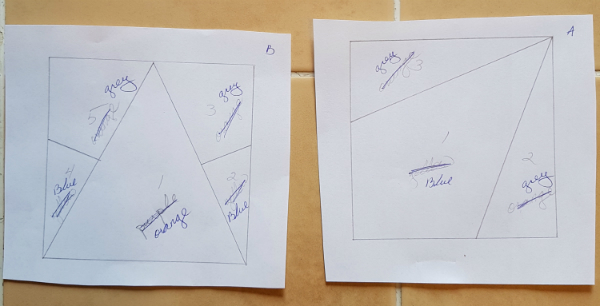 If you're anything like me, you'll discover your printer barely has enough ink to print out 1 copy, so you'll have to use your fancy lightbox (aka the dining room window) to trace the rest of the templates and add the numbers. 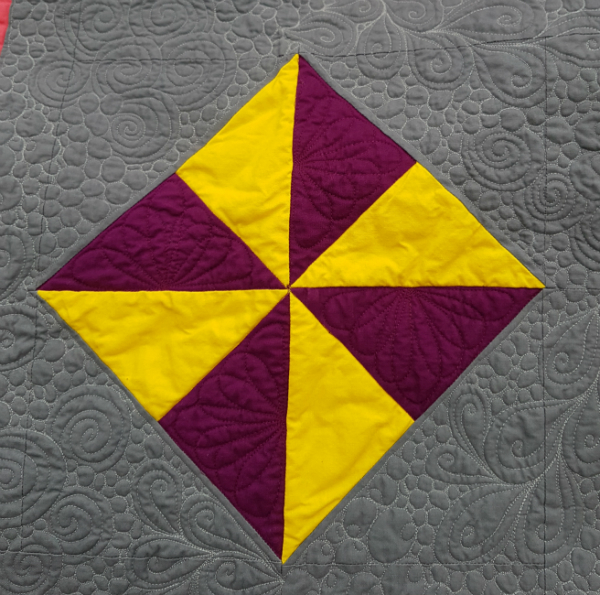 If you're new to paper piecing, follow this tutorial from Craftsy for the process. Paper piece 4 of Unit A using the blue 5" squares in the center and the grey 5 1/2" x 2 1/2" rectangles on the sides. For Unit B, we're going to piece a unit to use for pieces 2/3 and 4/5. 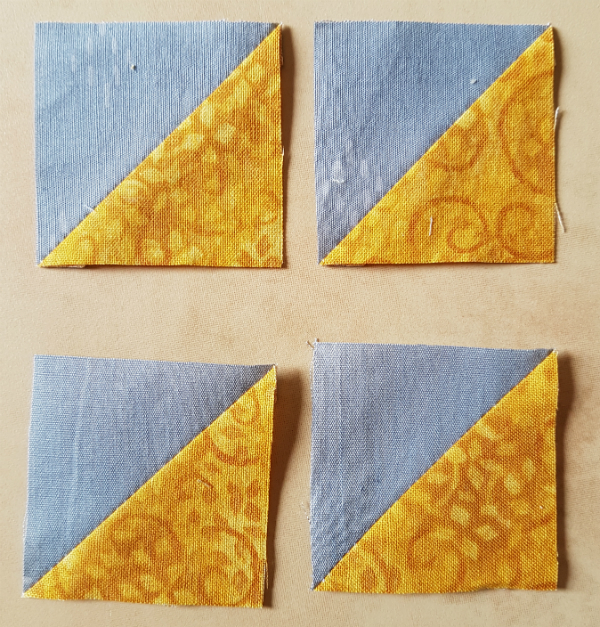 Sew a blue 3" square and grey 3" square together to make the pieced unit. 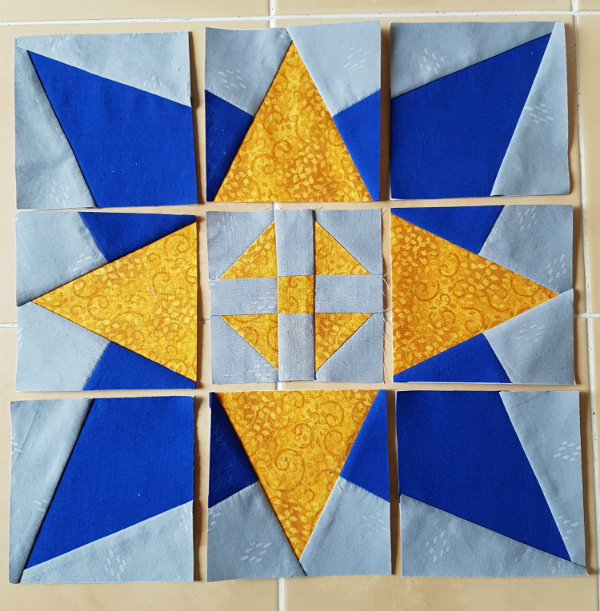 Paper piece 4 of Unit B, using the yellow 5" square in the center and the pieced blue/grey units on the sides. 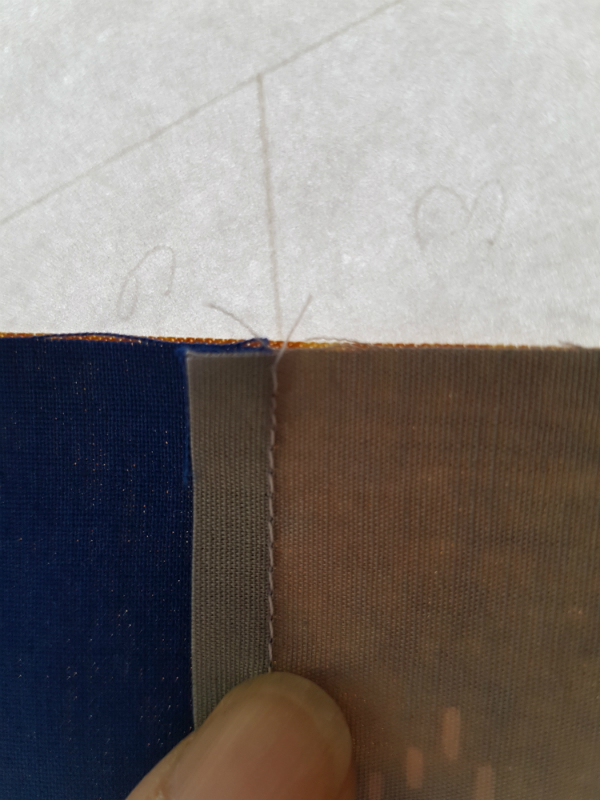 Line up the seam between the blue and grey with the line on the paper as shown, being careful to follow the colour placement note you made earlier. Trim all of the paper pieced units on the printed seam allowance line. Remove the papers and lay out all of the units in a 3 x 3 grid as shown. Join the units into rows, pinning at the intersections to help things line up. Then join the rows together. As always, if you make a Layered Star block, I'd love to see it! You can tag me on Instagram (@devotedquilter) or Facebook (@devotedquilterdesigns), or email me pictures or a link to a blog post (devotedquilter at gmail dot com). Be sure to check out the rest of the participants in the Summer Block Party and see what great blocks they've shared! The weather has finally made a turn for the better around here and I've started wearing my sandals again. I love wearing my sandals, but sandal feet aren't always the cleanest. This was especially true one day after spending most of the day outside with the kids I babysit and then going for a long walk after they went home. My feet were filthy! And my plans for the evening included basting a quilt made of light coloured fabrics, on my kitchen floor. Basting a throw size quilt on my floor means I will definitely be walking on the quilt since there is very little room to walk around it. My sandal-dirty feet and that quilt were not going to make a good combination! As I washed my feet, I thought of Jesus washing the disciples' feet and cringed. I really don't like feet. The idea of getting a pedicure holds no appeal for me, because I don't like having my feet touched. Ditto for getting a foot massage. And giving a foot massage? Definitely not going to happen! Then, that Sunday, my pastor was talking about the importance of serving others and made reference to Jesus washing their feet. He pointed out that not only would their feet have been dust-dirty (like mine were), but they would also have been dirty from walking on roads that were covered in animal droppings. Yuck!! I had never considered that before. I can't even imagine how dirty those feet would have been, can you? John 13:12-17 says, "When he had finished washing their feet, he put on his clothes and returned to his place. “Do you understand what I have done for you?” he asked them. “You call me ‘Teacher’ and ‘Lord,’ and rightly so, for that is what I am. Now that I, your Lord and Teacher, have washed your feet, you also should wash one another’s feet. I have set you an example that you should do as I have done for you. Very truly I tell you, no servant is greater than his master, nor is a messenger greater than the one who sent him. Now that you know these things, you will be blessed if you do them." I've always looked at this passage and mostly paid attention to the idea that 'no servant is greater than his master', and I've taken that to mean that no one is above doing any particular job. No matter how lowly the job, my position is never so exalted that I'm above doing it. 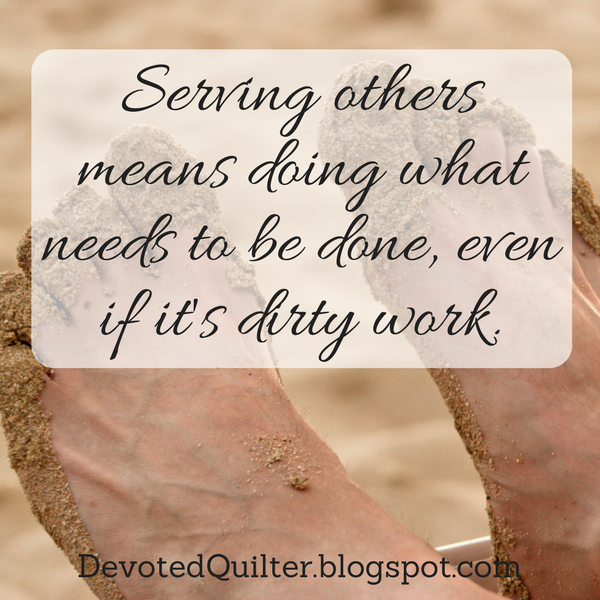 Jesus washed feet like a servant, so I'm certainly not above menial work. These past few days, though, I've been focusing on 'I have set you an example that you should do as I have done for you' and thinking about those incredibly dirty, stinky feet. Jesus washed them, and then He said that I should do as He did. So, not only are there no menial jobs that are beneath me, I'm also not excused from jobs I think are gross. When we think in terms of serving others, we tend to think of using the gifts God gave us. That means we tend to think of serving others by doing things we like doing. But, even if he didn't dislike feet in general, I doubt Jesus liked washing the disciples' disgustingly dirty feet. He still did it though, because it was a job that needed to be done. Looking around, are there jobs we avoid because they're dirty or gross? Do we try everything we can to get out of doing them? When we can't get out of doing it, do we cringe and complain the whole time? Somehow I doubt Jesus was making faces while washing their feet, or muttering under His breath about it being someone else's job to do it. According to Jesus' example, serving others means getting in there and doing what needs to be done, even if it's dirty work. I'm sure you've heard the phrase "Do as I say, not as I do," right? Maybe you've even said it, or words to the same effect. I remember a few years ago, when Zach had his hair long and he started twirling it absently now and then. I got after him for it and he said, "Why? You do it." Do I ever! I've twirled my hair for as long as I can remember, but I still told him it's a bad habit and one he shouldn't be starting. I was intrigued recently to read in Paul's letter to the Philippians that he tells them, "Whatever you have learned or received or heard from me, or seen in me—put it into practice" (Philippians 4:9). Whatever you have learned or received or heard, that's what Paul said to them. But or seen in me, that's what Paul did while he was with them. Essentially, he's telling them "Do as I say, and as I do." That's a pretty daunting thing to think about telling someone, don't you think? Follow my example - treat people the way I treat people, react to problems the way I react, use your time and money as I do, talk about people (or not) like I do...You would think you would have to have control over yourself at all times before you could tell someone else to do as they have seen you do. Interestingly, though, if you read more of Paul's writings, you will see that he didn't feel he had control over himself all the time. "I do not understand what I do. For what I want to do I do not do, but what I hate I do" (Romans 7:15). That I can relate to! Can you? If Paul found himself not doing the things he knew he should be doing, and doing the things he knew he shouldn't be doing, how could he tell the Philippians to do as they had seen him do? In thinking about that, I remembered a time years ago, before my own kids were born, when I watched a mom interact with her toddler daughter. The daughter was insisting they had brought a particular toy with them and the mom was saying they hadn't and trying to get her daughter to put on her coat to go home, but then the child they were visiting dashed into the play area and came back with the toy. The mom got down on her knees to be at her daughter's level and apologized very sincerely for not believing her. That apology has stuck with me all these years. The mom could have given an offhand, "Oh, I guess we did bring it" and continued getting ready to leave. Instead, she acknowledged she was wrong and that she was sorry. That modeled to her daughter exactly how to behave when you get something wrong. I think that's why Paul could tell the Philippians to do as he did. Not because he got everything right all the time, but because he was willing to acknowledge when he got things wrong. Being willing to say you're wrong and to ask for forgiveness when necessary requires humility. It also requires a willingness to be honest and real. The fact is, we're all going to make mistakes. That's not in question. The question is, how do we deal with those mistakes? And what lessons are the people around us learning from how we deal with our imperfections? 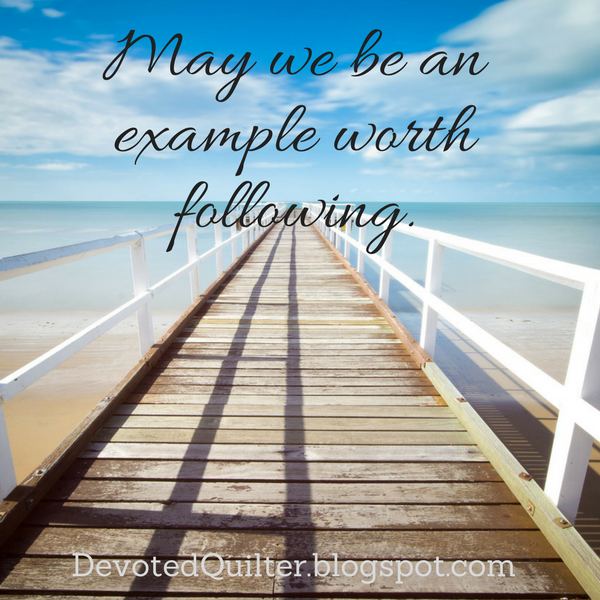 Are we an example worth following even when we get things wrong? The other factor in why I think Paul could tell the Philippians to do as he did is that Paul was trying his best to live right. No, he didn't get it right all the time, but he was always aiming to live for Christ. He could encourage them to do as he did because he knew that would mean they would be striving to live for Christ too. I know I'll never get everything right and so I like knowing that even though Paul knew he made mistakes, his example was (and is!) still worth following. May we be an example worth following too. I love to run. Unfortunately, I have an issue in my back that is sometimes made worse by running, especially running on hills. 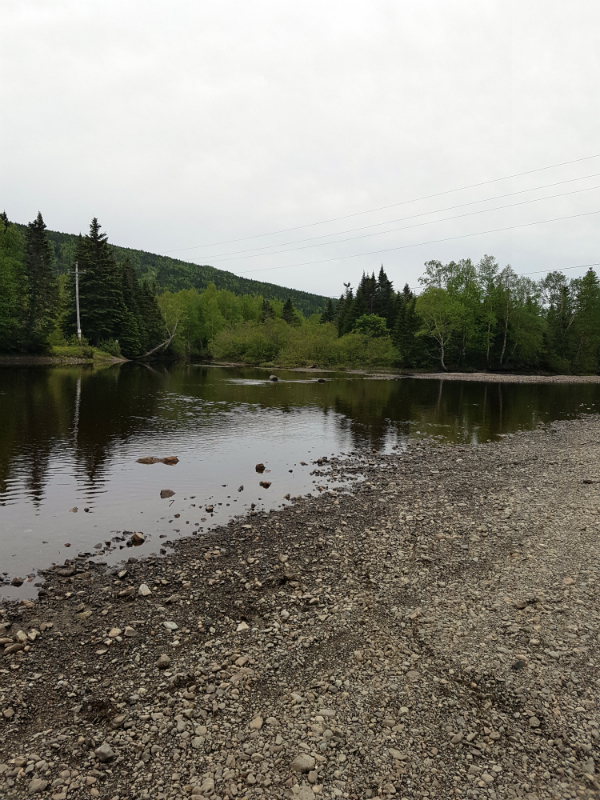 Avoiding hills while trying to run any significant distance around here is not easy. The entire town feels like it's made of hills! One of the best ways to avoid back problems, as I'm sure you know, is to strengthen the core, and my core was (is!) pathetically weak. So, to remedy that and hopefully protect my back, I started doing a strength DVD workout once a week. The first time through I just kept laughing as the instructor would say something like, "We'll do 15 reps, 5 times through." Yeah, right, we will! I didn't get anywhere near that many reps of any of the exercises, and still I was in agony for days afterwards. I kept at it, though, every Saturday morning, doing as much as I could, and gradually I started to notice that I had to skip fewer of the sets. I wasn't as sore after each workout either. I even started to see some definition in my arms, which I've never had before in my life! And my back has been mostly good. Then circumstances and sickness kept me from doing that Saturday morning workout for about a month. I didn't notice any difference in how I felt or how I looked...until the morning I did the workout again. It was a lot harder than it had been before my unintended break, and I was really sore afterwards again. 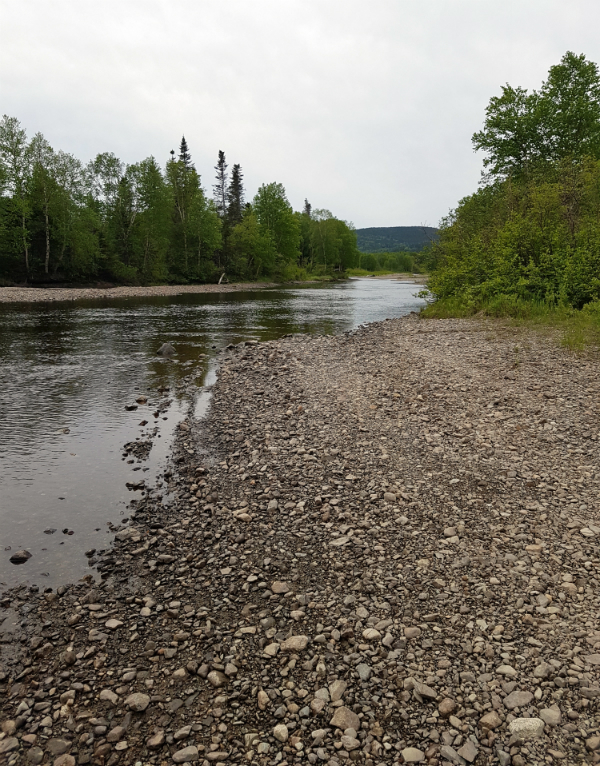 As I hobbled around with sore legs and abs for a few days, I kept thinking about Paul writing to Timothy and saying, "Train yourself to be godly. For physical training is of some value, but godliness has value for all things, holding promise for both the present life and the life to come" (1 Timothy 4:7,8). Isn't it interesting how Paul says, train yourself to be godly? I've always thought of it as if some people are just naturally godly and others aren't. Some people are naturally inclined to spend time praying and reading the Bible and others aren't. Some people are naturally resistant to the temptation to gossip and others aren't. But that's rather like saying some people are naturally able to run 5K and others aren't. Yes, some people are able to run 5K without a second thought because they've been running for years. And yes, some people would feel they were going to die if I told them to run 5K right now. But anyone can run 5K if they train for it. Training yourself means putting effort into it. It means seeing where you want to go and then working to get there. If I want to have stronger muscles, I have to put the effort into exercising. If I want to run 5K, I have to start by running shorter distances and build up my endurance. If I want to have a stronger faith, then I have to put the effort into things that strengthen my relationship with God. Training isn't always easy. It takes time and effort. And there are plenty of times we give excuses for why we should just take today off. It doesn't matter if we're talking about physical training or spiritual training, we are guaranteed to have days when we just don't feel like it. But, if we want a thing badly enough, we will push through that resistance and continue with the training. The results of physical training are easy to see, whether it's being able to run without feeling like you're going to die or seeing definition in your muscles. 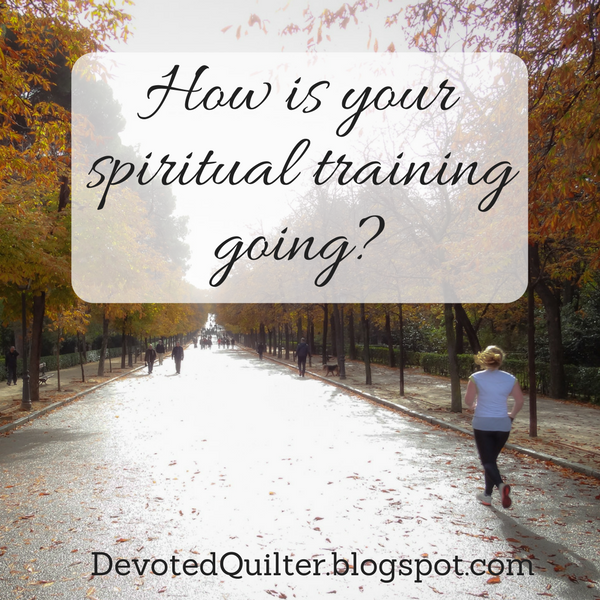 The results of spiritual training may not seem so obvious, but they are there just the same. 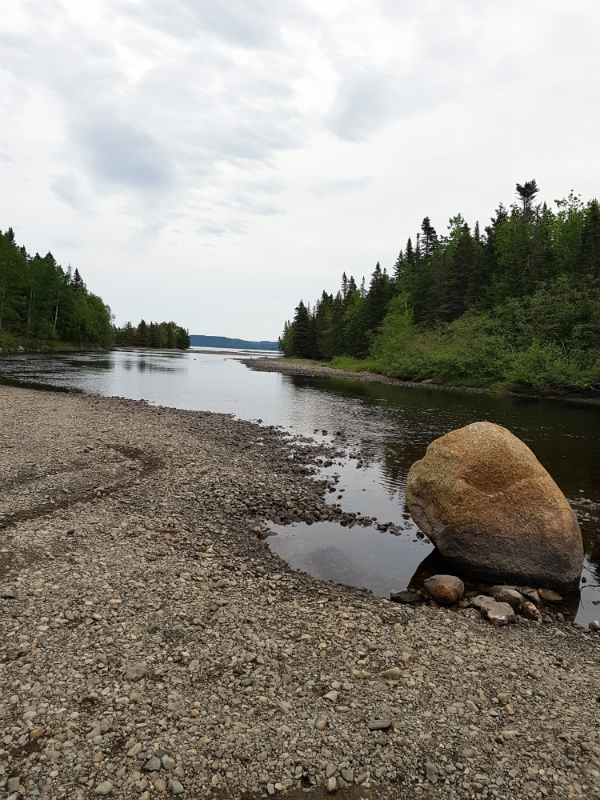 Things like peace in the midst of hard times, certainty that God is in control no matter what and a character marked by kindness, goodness and love. Those are results worth training for!